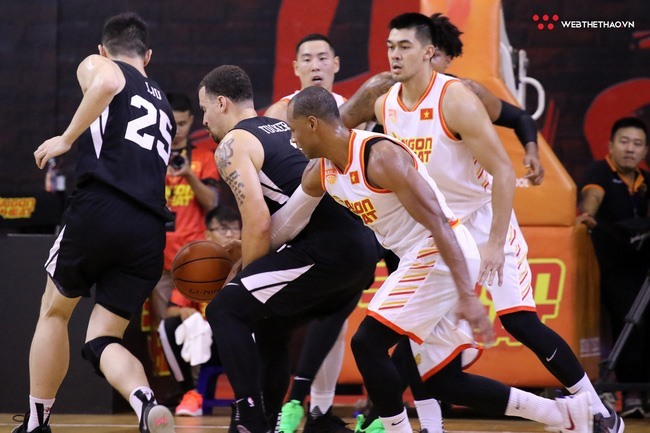 HÀ NỘI — Việt Nam’s Saigon Heat beat Macau Black Bears 96-93 during their second match in the ASEAN Basketball League (ABL) on Sunday evening. The game was held at CIS Arena in HCM City. Although playing away, the Bears took the lead at 21-14 in the first quarter. In the second quarter, with the support of thousands of home fans, the Heat fought back strongly with three-point shots from American-Puerto Rican Trevon Hughes and Canadian Murphy Burnatowski to narrow the gap to 22-25. After that, the two sides battled fiercely. Sang Đinh and Hughes of the hosts managed to see down attacks from Anthony Tucker and Filipino-American Mikhael McKinney. However, the two teams tied 45-45. In the third period, Hughes, Burnatowski and Chris Dierker shone from offensive rebound situations to help the Heat lead 73-72. In the last quarter, Ryan Watkins and Tucker scored points to take the visitors back in the lead. However, Hughes and Sang Đinh of the hosts quickly responded with three-point throws. With just 29 seconds left, the Heat retook the lead at 94-93. In this remaining time, the Bears had two chances to level the score. However, Sang Đinh played wonderfully to stop star McKinney’s attacks.